The first week back after the Christmas break saw five of our teams in action, and they came away with four wins, with the main board prize chasers all still in the hunt. The Armstrong, who’ve been on poor form so far this season, had a tough game against title-chasers Trinity College on Wednesday. For only the second time this season, though, we had a full-strength team to choose from, and we ended up putting in another strong performance to build on the 5½-2½ win over Dublin in the previous round. At one stage, it looked like a big win was on the cards; our Tim was an exchange up against their Tim, while their Stephen had sacced against our Stephen, who looked like being able to wangle his way out of it, while Kevin also had a big plus. We picked up wins on the bottom boards; Zdravko – not usually on board 8! – picked up a nice win against Alice O’Gorman which moves him to 4/6, a tally he’s only once beaten in eight years with the club. 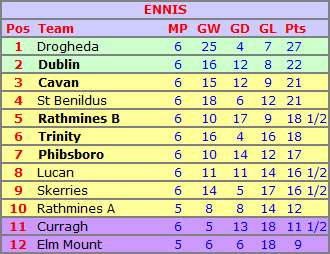 On 7, Brendan beat Oisín, which wasn’t to be the only case of Benildus beating ex-Benildus over the week. Mihailo added a win on board 3 in what was his first match in four months, while John drew and it looked like we were well on our way to that big win. Then things went wrong on a few boards; Tim fought back against Tim and held the draw despite material disadvantage, while Kevin produced a huge blunder to effectively lose from a won position in one fell swoop. Gerry was struggling against Luke Scott on 2 and could only draw, while Stephen eventually cracked under pressure from Stephen and lost. So we came away with just a narrow win when certainly a 6-2 was on offer. 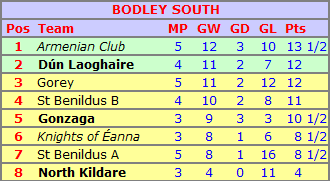 However, two wins in a row have eased any relegation fears, and we now have a 7½ point gap to eleventh, and with two matches against teams below us next up (Dún Laoghaire and Elm Mount), we can maybe start looking at targetting a seventh successive 4th/5th place finish. 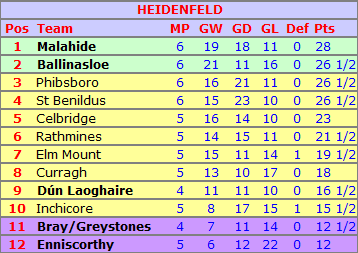 The Heidenfeld, on the other hand, have arguably been overachieving this year with a number of excellent results, and so a game against a Phibsboro side who out-rated us on every board bar one was just another challenge in what’s been an enjoyably and consistently strong Heidenfeld this season. Ciarán M took an early draw in a fairly wild game, as did I from a position where I was just a pawn down. Michael lost on 3, while Dave unfortunately hung his queen when a pawn up to put us 3-1 down, but we took a couple more draws – we’ve drawn almost half our games this year! – on the top two boards. Dylan had Kevin Butler in all sorts of trouble and was effectively a piece up as his opponent’s bishop was utterly entombed on h1, but in time trouble, he missed a pawn break to open things up, and instead the position became completely locked up and a draw was agreed; still a decent result against a 2000+ and one which easily makes our High Fives. Ciarán R drew on 2; despite hanging a pawn inside the first ten moves and later going two pawns down, he held on to ultimately reach a drawn Philador position. Our first win of the night didn’t come until after 11pm, when Brendan found a winning line in his K+4 v K+3 position, while on the bottom board Kavin rounded things off with another draw, having been winning in the middlegame but lost in the same-colour B+4 v B+2 ending before his opponent threw in the towel in his own attempts to find the winning line. Brendan and myself still have board prize chances; we’re currently on 4/6 and 4½/6 respectively. 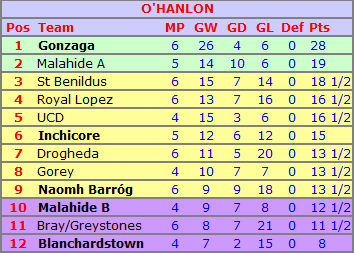 Also on Wednesday, the O’Hanlon travelled to Bray for what was a relegation 12-pointer, even if the league table after the event doesn’t show it that way. Ronan had played in advance and won on 1; he’s now on 4½/5. Finn, Eddie, Desmond and sub Danny all added wins, while only Liam came away with a mere draw – still not a bad result given it was his first match in over a year and half. The result lifts the team – temporarily anyway – up to third in the table, and still with three more of the current bottom four to play. 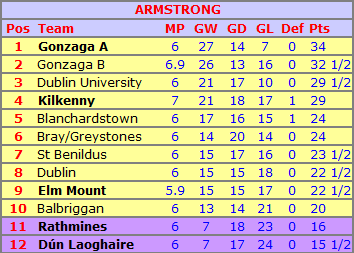 However, the next game is at home to runaway leaders Gonzaga, and probably the best we can hope for this season is a final day with nothing to play for, which would still be a big improvement on recent years! The Kildare double-header on Saturday saw us emerge with two more wins. In Kilcock, a 3-man Bodley South A team beat North Kildare 3-2. Robbie, Joe and Paddy were the trio who all won, while attempts to lure Cormac into a playing return sadly proved futile! Next up for the As is a local derby against the table-topping Armenians. The Ennis were in Curragh, with another full team as they went looking for a fourth big win of the season to get them right back into the promotion chase, having started the season with a 5-1 hammering at the hands of Drogheda. We were in trouble for a long while, with Slavko missing a zwischenschach and losing a piece, while Leon lost his queenside, which was particularly unfortunate as that’s where his king was. But William got pawns to e5 and d5 after 13 moves and won from there, while Lara won two pieces for a rook and then built up an attack which ended in mate; she’s now on 5½/6 and is the outright leader in the Club Top Scorer race. Odhrán ground out a win a pawn up – which describes most of his wins in fairness – while Kavin rounded things off with the club’s second win over a former player when beating Damien McCormick, a game which appears to have been close enough until the very end, when Damien hung a couple of pawns and then a piece, when the option was there to go into a probably worse but maybe holdable B+6 v N+7 ending. So a 4-2 win is another nice chunk of points, although it doesn’t see us move up the table any as Dublin, Cavan and Rathmines B all picked up the same win this round. Dublin are next up, the first in a series of huge matches as we’ve the bottom half of the table almost out of the way at this stage.